This is an ultra premium red nestling food that will keep your Canaries' beautiful red color. Ralf Red Color Food For Red Factor Canaries is for red-orange color bred canaries and other red birds. Ingredients: Crumbs, Made With Meals: Wheat, Corn, Oat, Rice, Soybean, Barley, Buckwheat, Bean, Pea, Water, Whole Eggs, Shredded Coconut, Precooked: Fresh Meat, Fresh Poultry Meat, Fresh Fish; Fresh and Dehydrated: Carrots, Dandelion, Chicory, Kale, Grapes, Bananas, Apples, Oranges, Pears, Apricots; Sunflower Meal, grounded: Shelled Peanuts, Brazil Nuts, Cashews, Filberts, Pecans, Walnuts, Almonds, Shelled Pumpkin Seed; Water, Grinded Coconut, Whole Eggs, Bone Meal, Precooked: Fresh Meat, Fresh Poultry Meat, Fresh Fish, Fresh and Dehydrated: Carrots, Dandelion, Chicory, Kale, Grapes, Bananas, Apples, Oranges, Pears, Apricots, Milk; Honey, Corn Syrup Solid, Casein, Salt, Brewers Yeast, Yellow Beta Carotene, Cod Liver Oil, Wheat Germ Oil, Dextrose Non-Viable Hemp Seed; Kelp Meal, Bone Meal, Milk, Honey, Corn Syrup Solid, Salt, Brewers Yeast,, Dextrose, Casein, Vitamin A Supplement, Vitamin D3 Supplement, Vitamin B12 Supplement, Riboflavin Supplement, Niacin Supplement, Calcium Pantothenate, Choline Bitartrate, Folic Acid, Menadione Sodium Bisulfite Complex, Pyriodoxine Hydrochloride, Thiamin Hydrochloride, d-Biotin, Ascorbic Acid, Manganese Sulfate, Zinc Sulfate, Ferrous Sulfate, Copper Sulfate, Ethylene Diamine Dihydrodide, Cobalt Sulfate, Magnesium Sulfate, Potassium Iodide, Vitamin E Supplement, Calcium Carbonate, Calcium Propionate Added To Preserve Freshness, Artificial and Natural Color and Flavor. 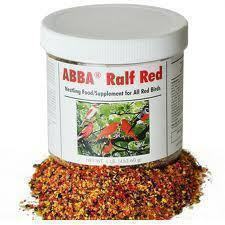 Notify me when 5lb Ralf Red Color Food For Red Factor Canaries is in stock.